Polls have shown Pena Nieto could win as many votes as his two rivals combined in the July 1 presidential contest, and analysts said Sunday’s attacks had not done enough damage to significantly undermine his hopes of victory. The two hour debate focused on how candidates would create more jobs, foster competition and restore peace to Mexico, which has been shaken by more than 50,000 drug-related deaths since President Felipe Calderon took office in December 2006. Calderon tried to stamp out the violence soon after taking power by sending in the army against Mexico’s drug gangs, but the violence has only spiraled, damaging support for the PAN and overshadowing his efforts to reform the economy. Job creation has failed to keep pace with Mexico’s growing population and the PRI, which ruled Mexico for 71 years up to 2000, has sold itself to voters as the only party with the experience in government needed to turn things around. The PRI’s long rule was marred by allegations of corruption and authoritarianism and the youthful and telegenic Pena Nieto has helped rejuvenate the party’s image. Lopez Obrador, the 2006 election runner-up, sought to brand Pena Nieto a creation of broadcaster Televisa and a tool of PRI elder statesmen like Carlos Salinas, a former president whose rule was dogged by accusations of corruption and cronyism. Meanwhile Vazquez Mota often alluded to accusations that the PRI made deals in the past with drug gangs to keep the peace. “In terms of justice, the most important thing is not to be part of organized crime,” she said after slamming Pena Nieto for his record as governor in the State of Mexico. After a number of gaffes at the turn of the year, Pena Nieto had ducked several challenges to a debate, prompting accusations from critics that he cannot think on his feet. Yet Pena Nieto, wearing a red tie and black suit, appeared ready for the attacks, blasting the PAN for its management of the economy, and accusing Lopez Obrador of having corrupt supporters among his ranks. Married to a soap opera star, Pena Nieto built his reputation with a series of public works that he promised and then checked off during his 2005-2011 governorship of the State of Mexico, a populous region flanking much of Mexico City. Vazquez Mota’s campaign has sought to brand the PRI hopeful as a liar who did not keep his pledges, a line of attack which Lopez Obrador also pursued vigorously during the debate. Pena Nieto accused his rivals of joining forces, as the PAN and the main leftist group, the Party of the Democratic Revolution (PRD), have done in a number of regional elections. “There doesn’t seem to be enough time for me to respond to the ones who appear to have made a deal again, the PAN and the PRD, because they’ve come here today with their knives sharpened,” Pena Nieto said. Political analyst Fernando Dworak said Pena Nieto stayed in control throughout, adding that even if he lost a few points from the debate, it would not do serious damage to his hopes. Polls show his rivals still have a long way to go, even if the gap has narrowed somewhat in the last couple of weeks. A voter survey before the debate for newspaper El Universal by polling firm Buendia & Laredo showed Pena Nieto with 39.2 percent support, down from 41.6 percent in a poll published on April 23. Vazquez Mota was up nearly five points to 22.1 percent, while Lopez Obrador was up slightly to 17.5 percent. Stripping out undecided voters or those expressing no preference, Pena Nieto stood at 49.1 percent. Analyst Zepeda said if anyone gained from the debate it would most likely be Lopez Obrador. Some locals in Mexico City, where Lopez Obrador was mayor between 2000 and 2005, agreed. “Lopez Obrador won because he criticized the PRI and the corrupt things they do,” said Rafael Cruz, 62, a shopkeeper. 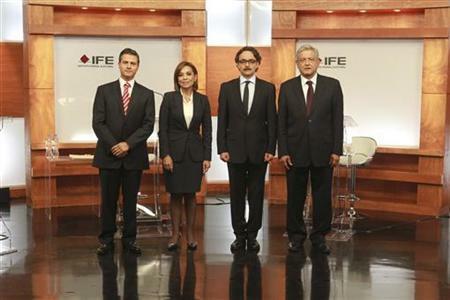 A fourth candidate, Gabriel Quadri of the New Alliance Party, a group with strong ties to the powerful teachers’ union in Mexico, also took part in the debate. Ignored by the other contenders, Quadri was able to speak freely and probably improved his standing, analysts said. Polls show he has no realistic hope of winning the presidency. This entry was posted in Print, Reuters and tagged Mexico, Mexico Election 2012, Reuters. Bookmark the permalink.